hello nice reederz its dennis the vizsla dog hay before i git started with toodays stunning ekspozay of sandy klawz i wanted to menshun that my gud frend cookie the beagle hoo wuz haff of the doo-o of cookie and cinnamon has gawn to the rainbo bridj at the too yung aydj of ate and a haff if yoo wood like to say gudbye to cookie yoo can do so heer!!! ok now on to my shokking investigayshun!!! yoo may hav herd of the faymus toy delivrer wot goze by the naym of sandy klawz and is nown for kliming down chimnees wile kerrying prezzents however is this the reel story or is it all just publik relayshuns??? reesently i hav had sum first hand ekspeeryense of sandy klawz and wot i hav fownd may shok yoo chek it owt!!! now i hav to warn yoo sum of the pikchers yoo ar abowt to see may shok yoo so enny small children or those with delikat konstitooshuns shud run away now!!! ok now that tucker has left the room ha ha lets start revyooing the evidense!!! now i no wot yoo ar thinking yoo ar thinking hay dennis maybe sandy klawz is just tired and resting up for his big nite of driving raindeer arownd but i am afrayd that theez nekst pikchers wil put that ideea to rest!!! tuckers nose is never rong!!! as yoo can see this so calld jollee old elf and bringer of toys is in fakt an eggnog swilling hard parteeing animal wot partees hard like an animal!!! and not only that but he didnt bring enny toys for me!!! but not to wurry i hav ben interrogating him and ekspekt him to krak at enny minnit and reveel ware the toys are hiddin!!! 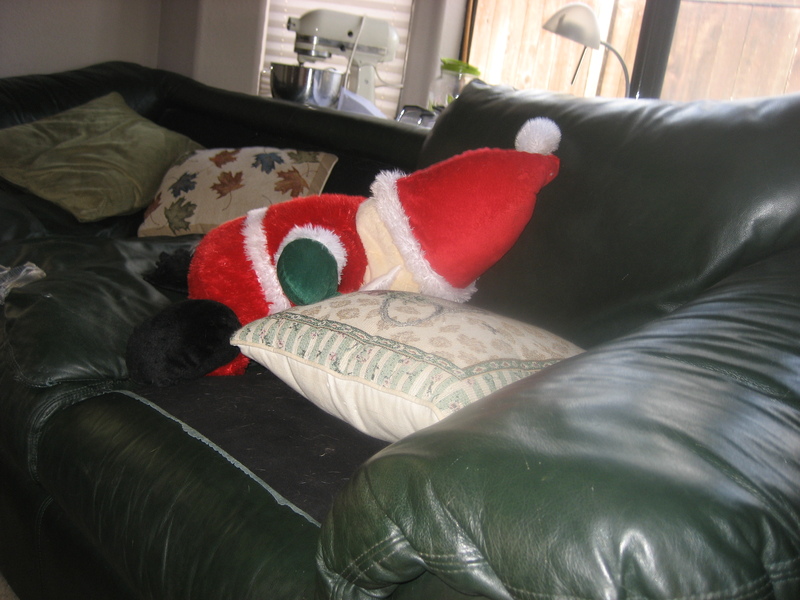 The Santa at your house looks dead drunk. The other one appears to be a bit sinister what with the scary cat and all! Uh oh. 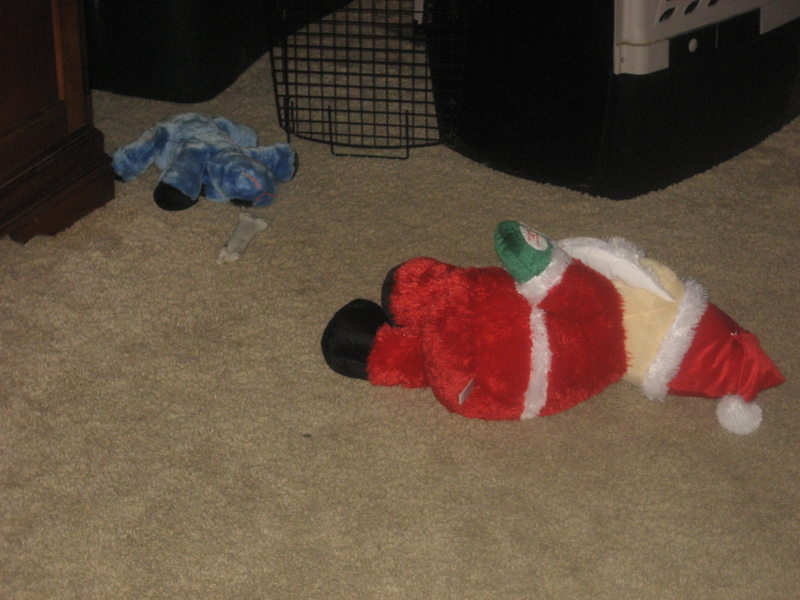 Santa Claws seems to have a small problem… Maybe we can use this information to get MORE presents! Dennis, aren’t you being a little ruff on the old Claus. After all he probaly has a killer hangover. Do you think the big guy with the creepy cat is the real Santa Claws and Dennis is after some fake guy? Does it scare you a little to think that Santa Claws actually reads what Dennis writes? We will know soon enough since once Dennis is on the case, HE NEVER GIVES UP! Go to it, Dennis! I miss you so much, last week my mommy was doing intensive French classes here, she was so busy but now she is at home and I’m happy again visiting blog’s friends. I’m worried about Santa, because I already made my wish list and I’m waiting for some new treats soon. I went a good kitty all this year, mainly because it was not easy to be inside my cage for more than 20 hours travelling from Brazil to Europe.It was a kind of trauma for me but it worth because I’m living happy with my beans in my new home. 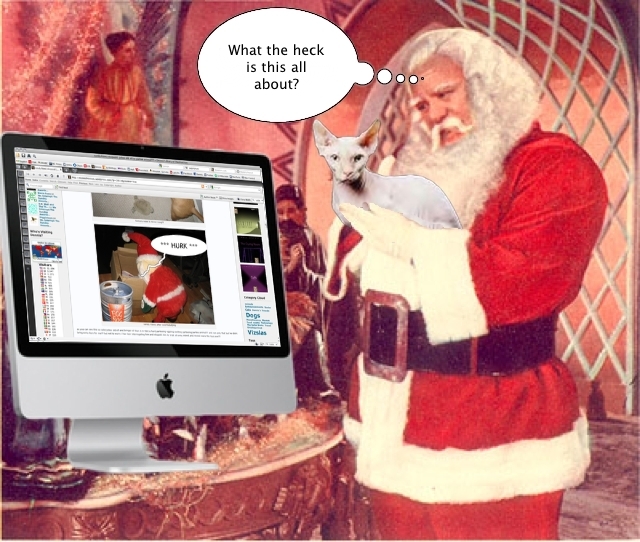 Of course Santa knows everything about us, however I was thinking to write a letter for him but right now I see that Santa is really modern and he has a computer in his place.So that, I will write an email for him!! !Great idea!!!! And about all gifts, I beg you to help Santa in this case because I know Dennis you are the only one that can help him.You are smart and intelligent and BEAUTIFUL!Please…please! That’s quite an interrogation Dennis. I see you weren’t swayed by Santa’s cuteness. And I must say that is one of the cutest Santas I’ve ever seen. The one in the last picture, however, is mighty scary. Awesome interrogation technique. I wanted to confess just watching. Is Trixie like the Santa amnesty international to make sure you don’t use inhumane techniques? Oh I notice the Bumble made an appearance on your header!! You know Bumbles bounce! Uh oh, perhaps Santa needs intervention or rehab? This was just too funny. Thanks for bringing me smiles and laughter for today. I loved the video too. 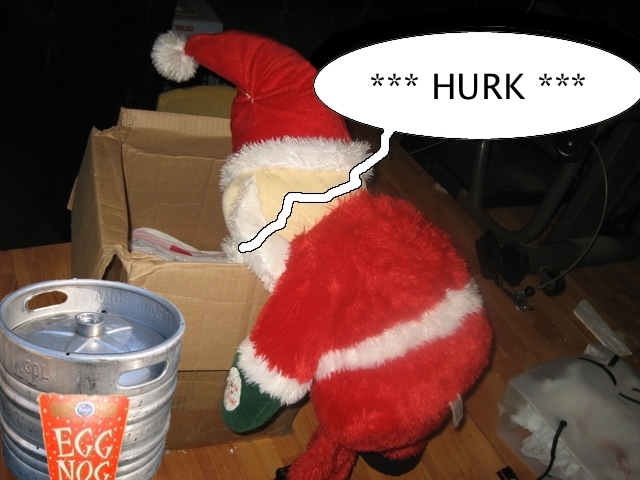 That Santa is a little worse for wear I bet. What an interrogation that was!!! uhoh Dennis, looks like you might be in trouble with the real santa paws now! I have no doubt that you’ll get to the bottom of it, Dennis. Especially after watching you, um, interrogate Sandy Claws. PS – Mom love love loves your header. That Grinchy guy is her favorite! (We’ve been over to Cookie’s pawrents – so sad…) And… anymore on the skunk saga? Santa does not appear too HOO HOO HOO! LOL 🙂 He needs to GO GO GO! Dennis – Our hu-dad was laughing really hard while watching your video. It looked like deadly serious work to us, but he found it really funny. Especially when you looked right at the camera. Dennis, my mom and dad had to watch your video several times! I hope this doesn’t mean bad news for Santa! They seemed very interested in your interogaton technique. I can’t imagine why! Ha ha, Dennis, after that romp through the house with you, no wonder he has his belly full of eggnog. Be careful! The real Santa is watching you! Oh Dennis….be careful…you don’t want coal in your stocking…. Thank god, drunk Santa made it semi safely over to you Dennis. I only gave him a few shots of whiskey I swear! Last year I put it in the milk and it curdled so this time I just gave it to him straight up! Urgh, I hope he didn’t up-chuck too much 😦 . Mineral water next year I promise! I wonder if Sandy KhlawZ is in one of the sandtraps? If Santy Klaws didn’t puke before.. that killer shake move sure would do it. 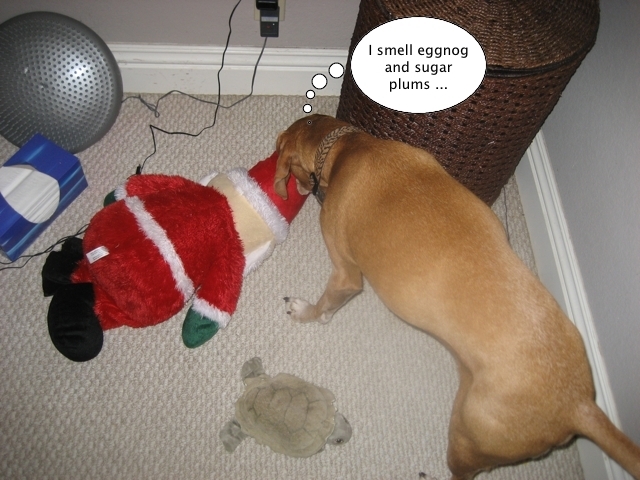 I always liked friends that smelled of egg nog, sugar and plums… he’s not that bad. you on the other hand…. might be on that list. Wow Dennis! You have a strong neck. 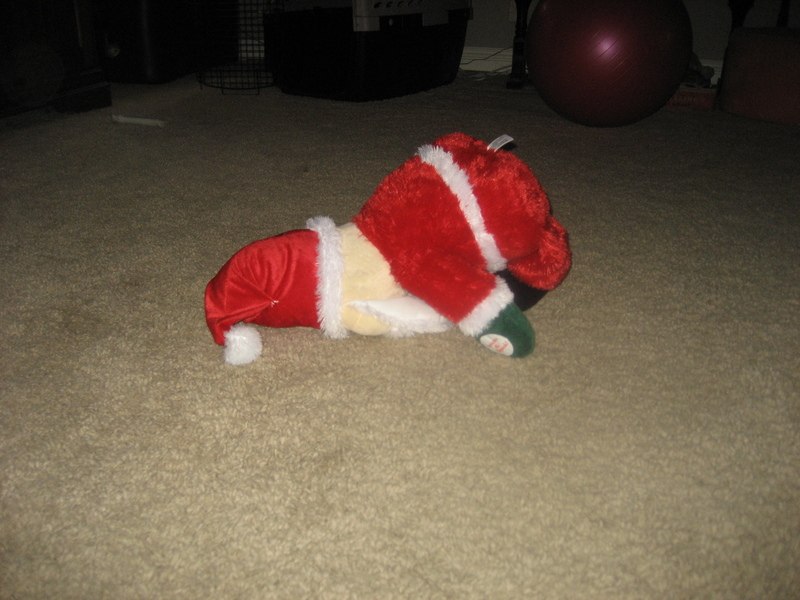 And poor Santa has a broken neck. Dennis! – Santa’s not drunk, you have shaken his brains loose! he better be still able to find us and not staggering around and talking nonsense. santa. eggnog. now that’s a sure way of finding out what’s inside them presents…..
Have a great day,my friend!!! Santa has no brain to speak of left after that interrogation. I predict no presents for anyone!